Toronto is experiencing a bit of a renaissance! Is it because the Pan Am Games were so successful? Because we have a mayor who doesn’t embarrass the city? 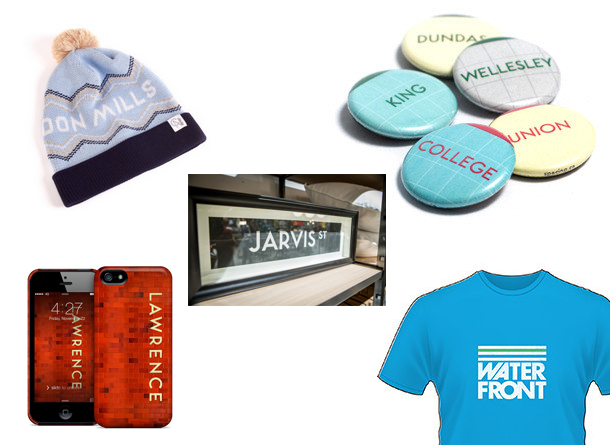 In any case, more and more designers are coming up with ways locals (and tourists) can show their love for Toronto. The Spacing Store at Richmond and Spadina has wide range of Toronto merch, including subway buttons, highway branded magnets, streetcar t-shirts and even vintage TTC posters. However, they don’t have exclusive rights to TO stuff – the Tuck Shop Trading co has neighbourhood branded toques and some t-shirts and StationToronto is selling phone cases with different subway stations on them. That’s only the tip of the iceberg – check out the links for more!